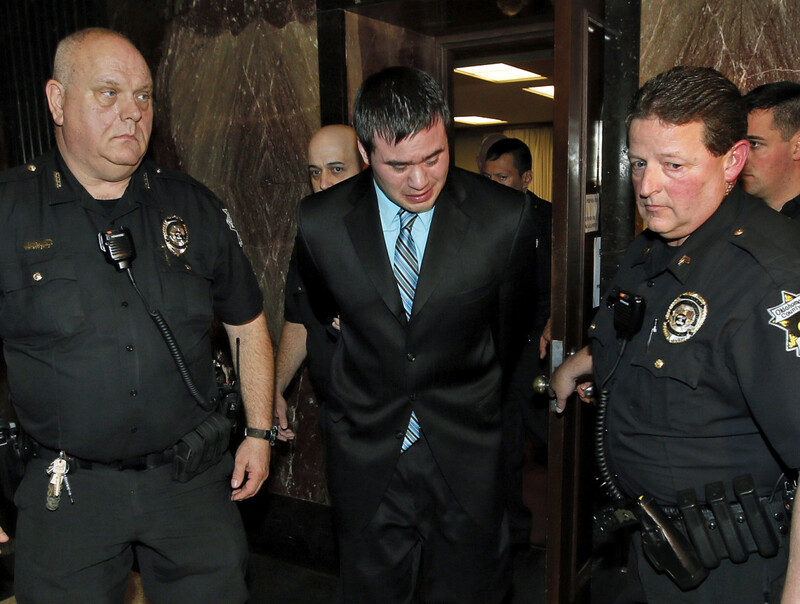 Will the Holtzclaw Case Lead to Long-Term Changes? Former Oklahoma City police officer Daniel Holtzclaw cries as he is led from the courtroom after the verdicts were read for the charges against him at the Oklahoma County Courthouse on Thursday. He was accused of sexually assaulting 13 black females between December 2013 and June 2014. A jury found him guilty on 18 of 36 counts. In one sense, the case against former Oklahoma City Police Officer Dan Holtzclaw was simple, though chilling. A police officer, working the low-income neighborhoods of his beat, used the power of his position to commit a series of sexual assaults against vulnerable women. His department eventually found out and investigated. On Thursday, a jury convicted him on 18 counts, and he could spend decades in prison. Or perhaps not. To some on the predominantly black northeast side, the concept of what Holtzclaw was able to do suggests larger injustices that a city that has been celebrated for its rise from economic ashes needs to address. Among them are economic inequities, social ills, high crime and incarceration rates, justice system fines and fees, domestic violence prevalence, and the paradox of needing, while also resenting at times, a strong police presence. These themes and others emerged in black leaders’ comments Friday and in a joint mobile-video project, “Talk With Us,” done by Oklahoma Watch and students at the University of Oklahoma’s Gaylord College of Journalism and Mass Communication in 2014 and 2015. On Friday, Oklahoma Watch talked to several black community and other leaders and residents about the Holtzclaw case and what it could mean going forward. For Harrill, Holtzclaw’s conviction highlights a deeper issue in the broken trust between police and the northeast area’s black community. Holtzclaw targeted black women, many with a criminal history, because they feared no one would believe a cop raped them. While Holtzclaw used that fear to coerce his victims into keeping quiet, the underlying sentiment that black people are untrustworthy is more widespread. Community leaders have to stay involved to keep the dialogue active as Holtzclaw fades from headlines, Harrill said. That includes groups like the Black Chamber of Commerce. That also means getting people talking with each other regardless of their skin color or religion in order to break down racial barriers. “Both sides have to be willing to listen,” Harrill said. “At the end of the day, it’s going to have to be African-American people that tell the African-American community that white people are OK.
Shelton said Oklahoma has a chance to step forward as a leader in handling racism. The city could hire more minority police officers to better reflect its diversity, expand the use of body cameras and create more ways for police to speak out about corruption within their ranks. Shelton said Oklahoma City and the state have many great police officers, but they fear being ostracized if they speak about corruption. Community involvement is key to keeping people focused on fixing racism, and that means engaging churches, politicians and communities, Shelton said. Johnson said the Holtzclaw trial highlights one example of the discrimination the black community faces. Nothing will change in Oklahoma or America overnight, Johnson said. That’s partly because tackling racism in northeast Oklahoma City or elsewhere will require education. Black people also have to be able to push for equal treatment without feeling threatened or endangered for standing up for their rights. “We’ve got a lot of work to do,” Johnson said. For Pettis, Thursday’s verdict showed law enforcement can do right by the black community in his district. Oklahoma City police quickly started an investigation when the first victim stepped forward, and an all-white jury convicted the officer, Pettis said. “As soon as they had the leeway to fire him, our police chief fired him,” Pettis said. Pettis added that the police union refused to represent Holtzclaw. The jury’s decision not to convict on all counts shows there are still issues with trust that need to be addressed. Real change for northeast Oklahoma City will only come through action, Pettis said. The city is implementing programs to increase the diversity of the police force and the city is working to implement police body cameras. Pettis said Oklahoma City’s efforts to address its racial problems will ensure it doesn’t turn into a flashpoint like Baltimore, Chicago or Ferguson. “These ladies will be victimized for the rest of their lives. So we as a society, as decent human beings, have got to be on the side of right. Prater recounted his prosecution of Jerome Ersland, a former pharmacist now serving a life sentence for shooting a black teenage robber in his store. “They GPS on those cars. I don’t understand how it didn’t click. He was an officer who is supposed to serve and protect. “It was disheartening that he got to stay at home and was not in jail. It was nice to see the police department fire him. You could tell they did know they have substantial evidence. I guess they were trying to look good. Nearly two thirds of seizures of cash by Oklahoma law enforcement agencies come from blacks, Hispanics and other racial or ethnic minorities, an Oklahoma Watch analysis of high-dollar forfeiture cases in 10 counties shows.